The ancient practice of eagle hunting is carried on today by a few hundred nomadic Kazakhs in Mongolia, Kazakhstan, Kyrgyzstan, and Xinjiang (northwest China). The majority of Kazakh eagle hunters live in Mongolia, and keep in touch with Kazakhs in other countries. Both Mongolia and the Kazakh community have a long history of women's equality in education, government, medicine, and other fields. Girls and boys start riding horses at age five and help with herds and putting up gers. Women can compete in horse racing, archery, and wrestling. Eagle hunting is traditionally passed down among male relatives, but there are no religious or cultural prohibitions against a girl becoming an eagle hunter ( bürkitshi, berkutchi ). Children commonly help to care for the eagles, go along on hunts, and attend eagle festivals. Anyone strong enough to carry an eagle can begin apprenticeship with one's own eagle. The traditional test of a bürkitshi is a successful hunting trip on horseback. Not everyone continues eagle hunting: military service, education, marriage, family, and employment can intervene. During the Soviet era, eagle hunting waned but began to reemerge in the late 20th century, with annual eagle contests, like the Sayat festival at Nura, Kazakhstan. Kyrgyzstan's Salburun festival began in 1997; Mongolia's festival began in Ulgii in 1999. Makpal, now a lawyer, continues to win eagle contests and encourages other young women. By 2012, her father Murat Abdrazakov was training three new girls aged 8, 12, and 15 in Kazakhstan. 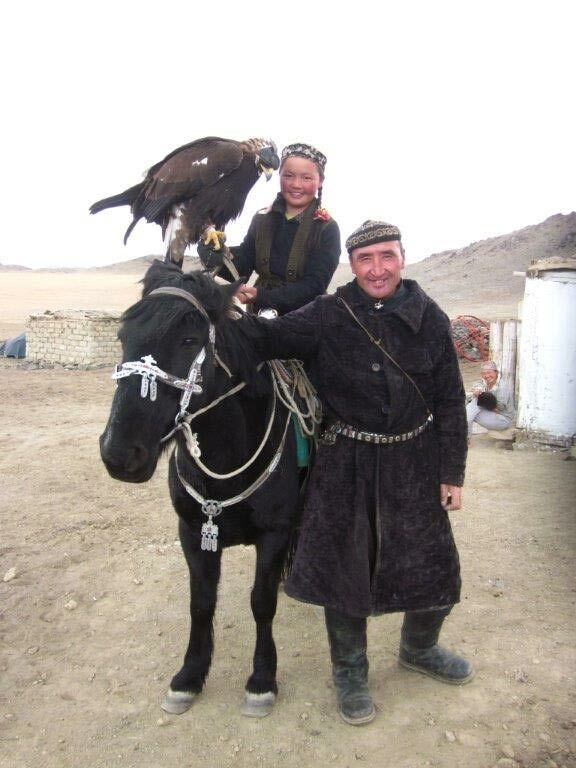 That year, a young horsewoman with an eagle appeared at the festival in Ulgii, Mongolia; in 2013, a young eagle huntress attended the festival in Nura, Kazakhstan. Meanwhile, in 2009-2013, the eagle hunter Kukan taught a young American woman, Lauren McGough, to be a bürkitshi. In 2013, Asher Svidensky photographed Kazakh bürkitshi in Mongolia and with the help of his guide “discovered” Aisholpan Nurgaiv, the 13-year-old daughter of an eagle hunter. Her older brother had joined the army and Aisholpan was helping to carry on the family legacy. 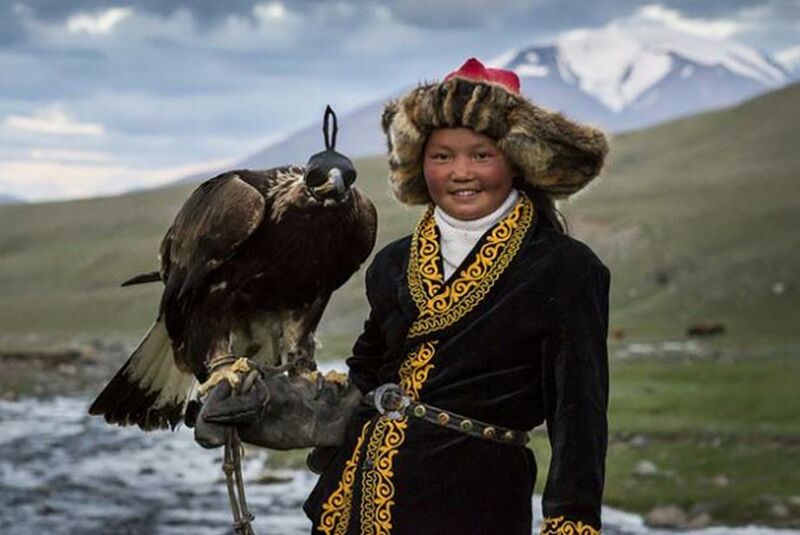 Svidensky's photo essay of Aisholpan posing with her father's eagle went viral in 2014. Apparently unaware of Makpal and other girls learning skills, Svidensky cited extreme cold and difficult terrain as the reason eagle hunting was reserved for males, and portrayed Aisholpan as the only girl. But since antiquity, the challenging conditions on the steppes have meant that men and women engaged in strenuous riding and other activities together. In early 2014, inspired by Svidensky's photos, film maker Otto Bell flew to Mongolia to secure the rights to Aisholpan's story, stating that he “felt a sense of responsibility to carefully bring her story to life through film.” Svidensky and Bell returned later in 2014 to film Aisholpan capturing a fledgling eagle (Ak Kanat, “White Wings”) and competing in the festival in Ulgii, where she won her first eagle hunting contest. Bell's breathtaking documentary "The Eagle Huntress" previewed at Sundance in January 2016 to international acclaim. In interviews, press releases, and publicity for the film--despite widespread knowledge in 2014 of Makpal Adrazakova's prior eagle hunting--Aisholpan is presented as the only girl in history to become an eagle hunter, defying Kazakh elders' belief that women are "too fragile and weak." Bell characterizes Mongolia as backwards and claims that because the Kazakhs live in such isolation they “are ignorant about what women can do.” Interviewed in Mongolia's leading newspaper in 2016, however, Aisholpan's mother Alma stated that there are no restrictions on girls deciding to be eagle hunters. This fact is confirmed by several well-known Kazakh eagle hunters such as Agii Makhsum in Mongolia, and by other female bürkitshi in Kazakhstan and Mongolia. Kazakh families are deeply committed to preserving their ancient legacy. Aisholpan's younger sister intends to carry on the family's heritage when Aisholpan leaves for college. An extraordinary young woman, Aisholpan has become an empowering example for girls around the world. Her achievements are impressive. But they are made possible not only by her own grit and skill but by her nomadic culture, in which women can be men's equals and girls can train eagles. Documentary photography and films are expected to be ethnographically sensitive and factual, so it is surprising that the creators of Aisholpan's story for Western audiences fail to acknowledge Makpal's eagle hunting prowess. They also misrepresent the historical independence of women in Kazkah and Mongolian culture. 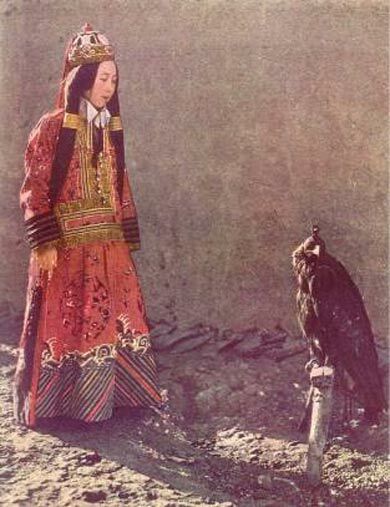 Strong women have always been part of the venerable Kazakh nomad heritage and girls were never forbidden to train eagles. Mongolia is far from backwards: women have voted and held office since 1924 in Mongolia, more than 80 percent of women have secondary education, and 70 percent of college students are women. In 2015, Aisholpan and Amanbol attended the Ulgii festival, along with a third young girl bürkitshi apprentice. She is the daughter of Shohan, a prominent eagle hunter in Mongolia. Historian of Central Asian falconry Takuya Soma points out that falconry disappeared in other less open, sedentary societies. 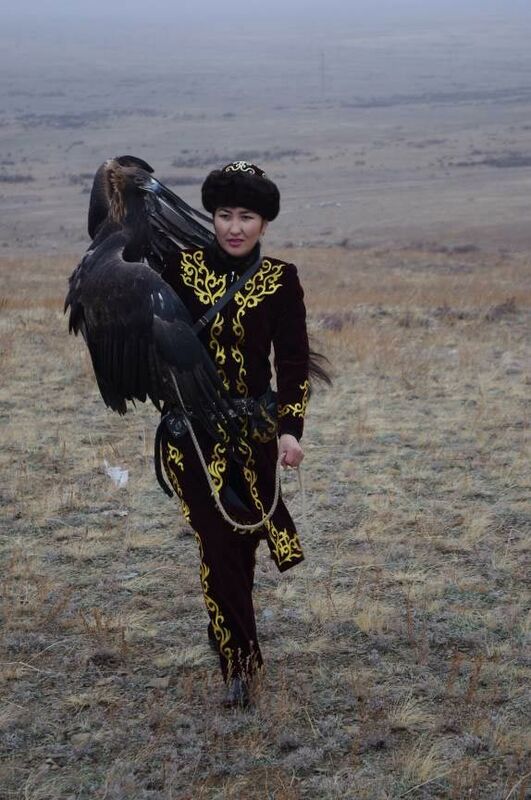 In contrast, Soma notes, eagle hunting persisted and has a future among Kazakhs because of their traditional belief that women can participate in the same activities as men. The “chief reason why eagle hunting is still practiced” is the “absence of strict social regulations to join.” As Dennis Keen notes, "curious adults and children absorb eagle hunting not just from 'masters' but from from the culture at large." Soma, Keen, McGough, and the Kazkahs themselves affirm that anyone young or old, male or female, is free to find a teacher, "capture and own their eagle, and hunt without any restrictions.” Rather than exclusive to “Kazakh masculinity," bürkitshi techniques are “shared with community members, elders, wives, and children,” even non-Kazakhs. This “open knowledge and free participation," open to anyone strong, capable, and determined enough, continues Soma, “is a remarkable trait in pastoralist society,” unlike the all-male elite hunting of sedentary cultures. “Generally men used to participate in the festival” at Ulgii, remarks Mongolian photographer Batzaya Choijiljav, but “the younger generation” of eagle hunters includes girls, ensuring its future. The intrepid eagle huntresses Makpal, Aisholpan, Aisulu, Amanbol, and the new generation of eagle hunters' daughters are capturing world attention through photographs and film. The great excitement surrounding their extraordinary accomplishments is a powerful affirmation of the egalitarian values that were once taken for granted among the ancient steppe nomad cultures. Acknowledgments: Thanks to Deborah Armstrong, Bek/Back to Bek Travel, Ariunbold Dorjsembe, Meghan Fitz-James, Alan Gates, Dennis Keen, Byeibitgul Khamsen, Kent Madin, Lauren McGough, Agii Makhsum, and Dauit Daukysh Ryskhan. Adrienne Mayor , Research Scholar in Classics and History of Science, Stanford University, is the author of The Amazons: Lives and Legends of Warrior Women across the Ancient World (2014), and The Poison King: Mithradates, Rome’s Deadliest Enemy , nonfiction finalist for the 2009 National Book Award. Soma, Takuya. 2013. "Ethnoarchaeology of Ancient Falconry in East Asia." Asian Conference on Asian Studies, International Academic Forum. Williams, Maynard Owen. 1932. "From the Mediterranean to the Yellow Sea by Motor." National Geographic 62 (Nov.): 513-80. Keen, Dennis. 2010. "Visiting Makpal Abdrazakova," Nov. 26-27. Central Asian Falconry Project. Batsukh, Yanjmaa. 2016. Interview with Aisholpan. Udriin Sonin (Daily News , Ulaanbaatar, Mongolia) Jan. 21. Choijiljav, Batzaya. 2015. "Golden Eagle Festival in Mongolia." Caters News . ADRIENNE MAYOR is a research scholar in the Classics Department and History and Philosophy of Science and Technology Program at Stanford University. I really enjoyed this article and I think the photographs are spectacular!